Teeth are composed of several layers. The outer layer, enamel, is translucent, while the layer just beneath that, dentin, tends to be yellow or gray in color. Dental enamel is porous, which can allow foods, beverages and tobacco to stain it along with the dentin below. 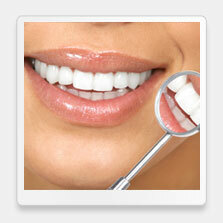 Teeth whitening treatments use peroxide solutions to remove these stains and restore teeth to their original whiteness. Take-home whitening kids and in-office whitening procedures can offer more dramatic whitening results than over-the-counter whitening kits. In-office whitening kits use professional-strength peroxide to open the pores of the enamel and bleach the dentin below. Take-home kits use a custom-fit mouth tray, which minimizes the risk of exposing sensitive gum tissue to the peroxide and the bleaching solution. You will wear your bleaching trays for a specific period of one to two weeks along with touch-up applications after that as needed or as directed. In-office bleaching procedures involve a solution that is painted directly onto your teeth which is then activated by a special light that sends it deep into the dentin. The procedure is repeated several times over the course of an hour, after which your teeth may be as much as eight shades whiter. Not all teeth bleaching procedures are right for each individual. Our West Hollywood cosmetic dentist may need to perform a thorough exam to ensure your teeth and gums are in good condition and that you are a good candidate for the procedure you desire. Contact us today to schedule your consultation.